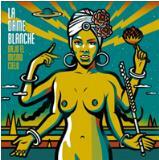 In 2016, la Dame Blanche, singer, flutist and percussionist, came out like a storm confirming her talent with the second album, named 2.Huge cigar on the lips, and a turban covering her head, she threw a bomb made of multi-coloured sounds, an explosive cocktail of hip hop, dancehall, cumbia, mumbhaton.Behind la Dame Blanche, character inspired of worldwide legends, is the daughter of Jesus "Aguaje" Ramos, artistic director of the Orquesta Buena Vista Social Club. Born in Cuba, surrounded by drums, rumba, and a family of musicians, the girl find out her own path: classical flute, then Hip Hop. This album shows more coherence but also more difference thought riches featuring. " I love collaboration, the interpretation of my music by others, and moments we live thanks to music". She shares few songs with a gipsy musician, or Nelson Palacios, a cuban artist.Bajo El Mismo Cielo stands out as a big party where humans, but also spirits, invite themselves.